Every band has its secret weapon, its ace in the hole—something that sets it apart from all the others; Green Day has Billie Joe Armstrong’s iconic voice. Simon and Garfunkel had Paul Simon’s beautiful, pot-infused lyrics. The Killers have front man Brandon Flowers’ unique musicianship and electricity…or do they? The band, Big Talk, consists of Vannucci on vocals and guitar, Taylor Milne (Vannucci’s former band mate from his days with Expert on October) on lead guitar, Alex Stopa on drums, Tyson Henrie on bass, and John Spiker (former member of Filter) on keyboards. The self-titled album delivers on every level, thanks, in no small part, to Vannucci’s ability to lead. Not every drummer can comfortably make the transition from the back of the stage to the front—Levon Helm being a prime example—but Vannucci did it beautifully, creating a fun, energy-filled rock album. 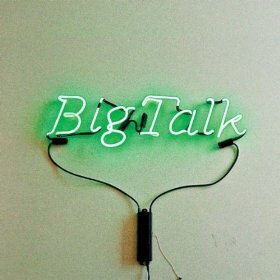 While parts of Big Talk play like the talented little sister to Sam’s Town (the Killers’ 2006 platinum-selling album), the unexpected eclecticism is what really gives the album its edge, allowing it to stand on its own. Take, for instance, “No Whiskey.” Placed smack-dab in the middle of the album, between two rock tracks is this great blues song, telling the story of a man who won’t drink because he’ll never find his way home if he does. It’s absolutely random, and it makes no sense to have it on the album, but having it there shows the band’s versatility, and it makes an already strong album even stronger.